"Liss’s mesmerizing prose is so finely crafted that one might mistake his book for literature, were it not for the fact that it is so well plotted and entertaining to read that it is obviously a work of genre fiction. Fans of English history will no doubt find much here to enjoy. Even those who don’t care for crumpets… will be hard pressed not to enjoy this wonderful book. It is easily one of the year’s best." "Liss [has] returned for another round with Weaver, and it’s a pleasure to have him back." "Liss’s pungent re-creation of 18th-century London–an anarchic place of mobs, ‘cheerful and surly simultaneously,’ where any public gathering is never more than a hair’s breadth from a riot–that makes this book, like its predecessor, so endlessly enjoyable." "This is a splendid read and will provide readers with still another vivid panel in Liss’ ever-expanding portrait of Hanoverian London." 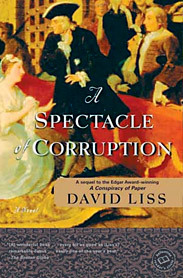 "I became completely dazzled by Liss’ scholarship, his solid story-telling and gritty re-creation of life and politics in early 18th-century England…"
"Liss makes the readers see, smell, feel and taste London of the 1720s, from its finest parlors to its smoky, grimy pubs and excrement-filled alleyways… Liss pulls all the loose plot ends together for a satisfactory — and surprise — ending. Only with Liss, the novel’s symmetry is more artful than typical. The dialogue and narration are marvelously readable and smooth." "Readers… will relish Liss’s glorious dialogue, lively rogues, fascinating setting and indomitable hero." "With eloquent wit, Liss manipulates the concepts of misdirection and probability theory in his serpentine third novel… Dazzling."